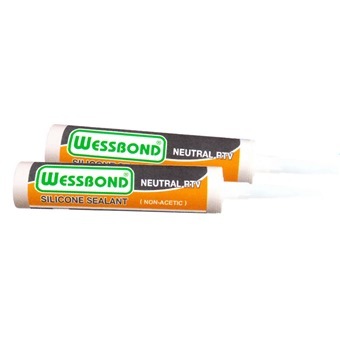 A one component RTV silicone rubber sealant that reacts with the moisture present in air to form a strong, durable and long life resilient rubber. lt will adhere to clear glass, metals, many plastics, painted surfaces, aluminium, galvanized steel, stone, concrete and masonry surfaces. Suitable to seal and weatherproof windows, door framed, roofing, rainwater and cladding joints. This sealant has excellent resistance to cold, rain, ozone, heat and sunlight, lt may be applied in sub-zero weather (-350F) without loss of physical property characteristics.